WIC (Women, Infants, Children) is a supplementation nutrition food program to help families stretch their food budget. There is a fee but costs are dependent on income, household size, and insurance status. Call (859)-236-2053 for more information. 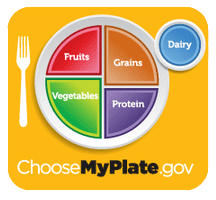 MyPlate illustrates the five food groups that are the building blocks of a healthy meal using a familiar image- a place setting for a meal. It is a reminder to find your healthy eating style and build it throughout your lifetime. The right mix can help you be healthier now and in the future. This means:• Focus on variety, amount, and nutrition. • Choose foods and beverages with less saturated fat, sodium, and added sugars.